Seepage, condensation and flooding cause surface damage and structural damage to both interior and exterior concrete block walls. While severe structural damage presents immediate danger, relatively benign symptoms of water damage, such as mold growth, present serious long-term health risks. 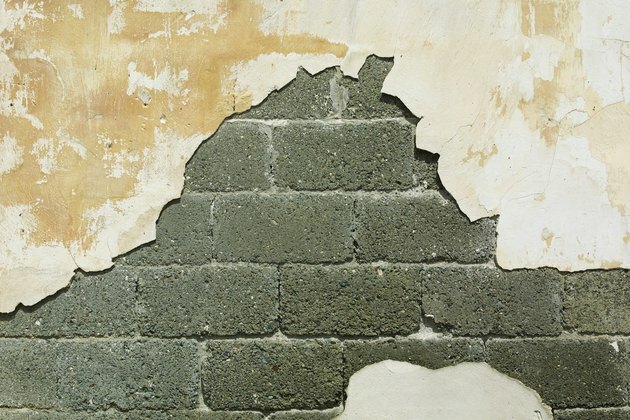 If you learn to inspect walls and identify the causes of water damage, you can successfully repair and restore your concrete block wall. Seepage deteriorates block wall surface coatings, such as stucco and plaster. Both seepage and condensation cause concrete block walls to feel or appear wet. Seepage refers to water passing through the wall from the other side while condensation refers to water collecting on a wall due to moist interior conditions. Seepage can cause serious leaks or compromise the strength of the mortar that binds the concrete blocks whereas condensation often causes surface damage to block walls or encourages the growth of dangerous mold. You can test for seepage or condensation by adhering a small piece of aluminum foil to the wall. If water collects on the underside of the foil, you have seepage; if water beads on its exterior, you have condensation. Efflorescence is symptom of water evaporating from a block wall's surface. As water evaporates, it leaves salts on a block's surface in the form of a scaly white buildup. Many new walls experience efflorescence soon after construction. Efflorescence is often a recurring problem for walls in wet conditions, such as basement walls. You can remove efflorescence with stiff-bristled brushes, by sandblasting or with specialty cleansers. However, cleaning only provides a temporary solution; efflorescence will occur as long as moisture allows salts to travel to the wall's surface. To repair recurring efflorescence, builders must address waterproofing issues. 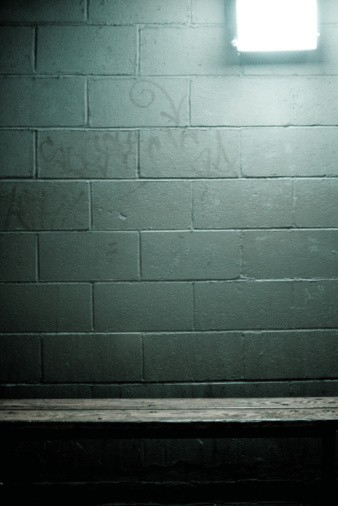 Water causes damage to a concrete block wall's structure and surface coatings. Structural damage includes cracked or loosened mortar joints and shifting blocks. While seepage usually causes damage to mortar joints, foundation drainage typically causes shifting and wall movement. Without proper drainage or compaction below walls, the earth beneath wall footings can settle and cause walls to move. Surface damage commonly includes peeling and cracking surface coatings, such as paint and stucco. You can apply waterproofing and drainage solutions both during new construction or renovations. Common waterproofing methods include the application of parge coats, which are thin cement-based products, rubber membranes, waterproofing paint or asphalt-based waterproofing compounds. Common drainage methods include French drains and drain tiles. The term French drain refers to a gravel-filled trench that allows water to percolate to its bottom and away from a foundation or wall footing. Drain tile is specially designed, perforated pipe that builders lay within French drain trenches.